Method: Beat the curds well. Add salt to beaten curds and mix well. Grind coconut gratings and green chilli with little water into a fine paste. Add the paste to the curds and mix well. Heat a tadka pan/ spice pan (தாளிக்கிற கரண்டி), add mustard seeds and when they start to sputter, add asafoetida and switch off the fire. Add the seasoning to the pachadi. Garnish with curry leaves. Pachadi can be served as an accompaniment to sambar rice, tamarind rice or part of the feast menu. Note: You can prepare this pachadi with ginger as well. 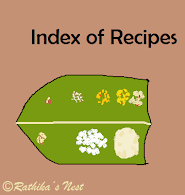 Grind coconut gratings, ginger (a small bit) and green chilli into a paste, and proceed with the recipe as above. Ginger adds a specific taste to the preparation.